Pubs in train stations are almost universally dreadful. They rank somewhere with A&E waiting areas and traffic jams on the list of places that are dire and depressing. What these places all have in common is that if you’re there you probably don’t have a choice. No one sets out to spend a day slowly bleeding to death in a hospital or staring at the back end of a Renault Megane anymore than you might set out to have a pint whilst in a train station. As a seasoned train traveller I’m pretty confident in saying that The Parcel Yard is actually the only exception to this rule as it is a train station pub worth a visit in it’s own right. 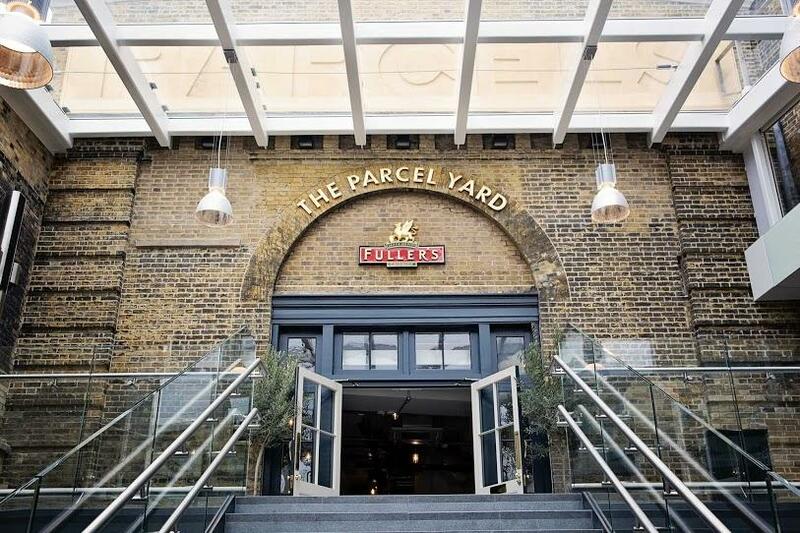 Far from being the usual fruit machine garnished box of despair The Parcel Yard is established in the listed portion of the old Kings Cross Station and is spread across two floors. Much of the decor I suspect is an affectation but the name of the pub alludes to the genuine history of the building as the old parcel storage room for the station. Its sprawling mass is a little tricky to navigate and spotting a seat in the distance is no guarantee you’ll claim it as you navigate around the various little rooms set around the central glass roofed courtyard. Being in a station the clientele is understandably unpredictable. Expect suitcase laden pensioners, backpack sporting festival goers, sozzled commuters and dead eyed delay hit no hopers staring mindlessly at the departure board as they nurse what they forlornly imagine might be their last pint. There’s always a fair bustle whatever the time though as this is one of the busiest stations in the country let alone the city. Food is served all day here and again bucks the trend for what you’d expect in a transport hub. No 15% meat service station style sausages or anaemic airport sandwiches; there is a chef and a menu awash with things you’ll probably want to eat. In terms of beers it’s yet another Fuller’s pub so expect a rotation of their range to be on offer. Really the only thing I don’t like about this pub is the location. It’s a shame that this isn’t alongside the Thames or tucked away on a quirky street in East London. It does diminish it’s grandeur slightly having to wade through an obstacle course of infernal wheely suitcases and past an endless line of sad acts wanting to have their photograph taken with a wall and half a shopping trolley in the name of Harry Potter. But if you’re able to overlook this issue then you should pay a visit and if you’re even slightly delayed you’d be mad not to swing by. Afterwards I guarantee it’ll be only train station in Britain you’ll ever look forward to being delayed in.